Singapore has made the largest seizure of scales in its history. 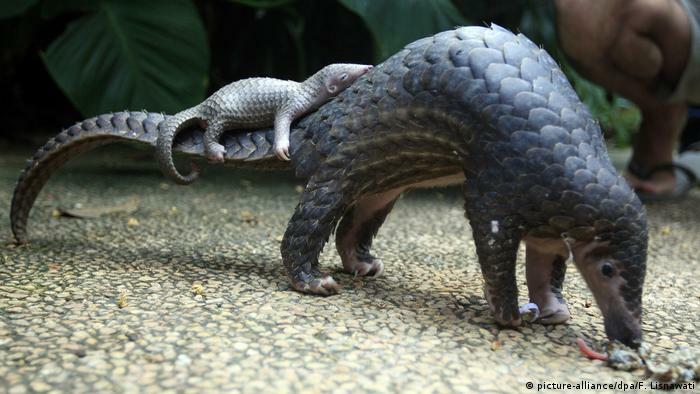 Endangered pangolins are the world’s most trafficked mammal. Authorities have seized around 26 tons of pangolin scales belonging to around 38,000 of the endangered species over five days, authorities said Wednesday. In the latest seizure, customs officials on Monday found 12.7 tons of pangolin scales in 474 bags in a container marked as “cassia seed.” The haul comes after authorities on April 3 discovered 12.9 tons of pangolin scales in another container disguised as frozen meat. Both shipments were en route from Nigeria to Vietnam and had a combined value of around $77 million (€68 million), making it the biggest pangolin scale seizure in Singapore’s history. It was unclear if the two shipments were related. Pangolins, also known as scaly anteaters, are the world’s most heavily trafficked mammal, with more than a million taken from the wild in the past decade, according to the World Wide Fund for Nature. Experts believe the amount seized represents only 10% of those killed. There are four species in Africa and four in Asia, all of which are protected and endangered. Pangolin scales are made of keratin, the same material in human hair and fingernails. The scales account for 20 percent of the mammal’s weight. In China and Vietnam, the scales are used in traditional medicine and their meat is considered a delicacy. In August 2018, Hong Kong police seized 7 tons of pangolin scales representing approximately 11,000 pangolins, according to Pangolin Conservation. These scales had originated in Nigeria. The seizure of 26 tons of scales proves that African countries like Ghana, Nigeria, Uganda, etc are a major originating/transit point for illegal wildlife. Trafficking of these animals and the byproducts is driven by demand in Asia and the Middle East. Similarly, Hong Kong, Vietnam, and Indonesia are the popular transit countries for the illicit smuggling of preposterous quantities of the endangered pangolin’s scales. The Nigerian Minister of Environment, Suleiman Zarma said that “Nigeria is being used as a transit route for illegal wildlife trade and the image of our nation is being tarnished globally,’’ the minister said. He restated the federal government’s commitment to the fight against illegal wildlife trade, saying that Nigeria signed and ratified the Convention on the International Trade in Endangered Species of Wild Fauna and Flora (CITES) in 1974. It is unbelievable that pangolins are being killed at such a massive scale (26 tons of their scales), yet these scales are made up of keratin, which happens to be the same material which makes up the hair and nails. However, superstition and orthodox beliefs are behind the increased demand for pangolin meat and body parts. In turn, it fuels their poaching and smuggling. More than a million pangolins are believed to have been poached from around the world in the past decade. To protect the pangolin and other endangered species; poachers, smugglers, and customers must be identified and prosecuted. Although this is the right goal, its implementation of this approach is extremely difficult because existing investigative methods will take a long time to finish the job, before which the traffickers would have adapted, making this a never-ending pursuit. A completely new method which is based on latest scientific methods is needed so that suspects in a quick yet reliable manner. The sheer scale of this crime warrants science to devise a new technology which is efficient, reliable and non-invasive. Modern science has made it possible for the supply chain of pangolin scales and other smuggled wildlife items like ivory and rhino horns to be understood by introducing a revolutionary information gathering mechanism which can not only interrogate in. A Massachusetts based company called Brainwave Science has introduced a way to interrogate suspects and witnesses in a non-invasive method. This technology is called iCognative. It can gather crime-related intelligence from the test subjects. The gathered information is not limited to the testee and their individual crimes, but a plethora of information regarding the criminal organization they belong to, the kind of training, their hierarchy in their organization, their level of involvement in a crime, even their innocence. Once the investigation is carried out, the gathered details can be used for conducting an iCognative test on the men who have been detained. The test is conducted individually on each test subject, and it usually takes 45 minutes. iCognative measures brain responses and can accurately identify if certain crime-related information is present in the brain of the test subject or not. For this, a laptop and a specialized headset are used. The headset records brain responses and transmits them to the computer. The results of an iCognative test are more than 99% accurate. On the other hand, a DNA or a fingerprinting test has limited applicability because related samples are only uncovered in only 1-2% of the cases. iCognative is an extremely useful technology because it is applicable in more than 85%-90% of all criminal and civil cases. iCognative is not limited to trafficking cases, but also equally applicable to human trafficking, drug trafficking, immigration, national security, border security, counter-terrorism, and law enforcement. To conduct the test, crime related to stimuli is needed in the form of images, words, and phrases. These are presented to the test subject on a computer screen. As soon as they are seen by the test subject, their brain emits specific responses to reveal whether they have or have not the memory of the stimulus. This is the principle behind iCognative. iCognative is extremely easy to use, highly portable, customizable, yet extremely lethal to the criminals. The results are 99.9% accurate and highly reliable. To stop the poaching of pangolins (especially when it is in terms of a mammoth scale of 26 tons) and other endangered species, and to bring the poachers, smugglers, and customers to the books, the enforcement agencies of Africa and South Asia need to implement iCognative immediately. Because there is always a heavy workload and multiple open cases, it is not feasible to dedicate the workforce to one case or mission alone. There is a need for efficiency and reliability in the process of interrogation. Brainwave Science’s iCognative can be of tremendous help to the Indonesian and the Nigerian authorities in battling the large scale trafficking of Pangolins and other endangered species. iCognative will not only help to identify the traffickers amongst the innocent but also help extract valuable information and understand the hierarchy of global trafficking organizations.